The U.S. Energy Information Agency (EIA) published a blog post this week showing that coal produced by mountaintop removal mining in Central Appalachia decreased by 62 percent between 2008 and 2014. According to the agency, a combination of factors including abundant and cheap natural gas, growing use of renewables, flat electricity demand, and environmental regulations has contributed to the sharp decline. It’s important to note that what the EIA defines as mountaintop removal is not the same as what folks in Appalachia call mountaintop removal. Because the EIA doesn’t count a lot of large strip mines in the region, the total numbers here likely underestimate the number of mines threatening human health and the environment. 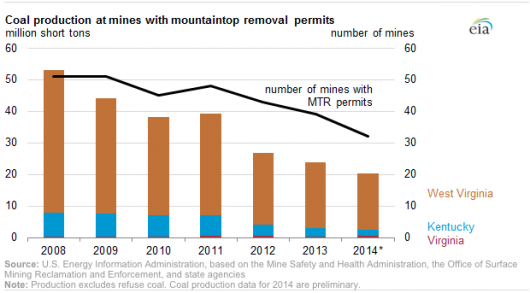 For the same reason, production declines for mountaintop removal specifically may not be as steeps as the EIA states. What is clear, though, is that both production and the total number of mountaintop removal mines is way down in West Virginia, Kentucky and Virginia. Our work is paying off, but we still have a long way to go. Mountaintop removal is still putting communities at risk. In fact, in many places, active mining operations are getting closer to communities. Demand for Central Appalachian coal will continue to decline, making further progress inevitable. But we won’t end mountaintop removal by relying on the market alone. The Obama administration must take further action to protect Appalachia by issuing a strong Stream Protection Rule, which is due out this month. It is incredibly important not to look at these numbers and conclude the problem is just going away. Production numbers don’t convey the extent of human health impacts. Mine location, blasting extent, and impacts to the environment are much more important indicators of damage done to communities. Fewer mines is good news. But don’t expect us to celebrate. The EIA reports that last year there were over 30 mountaintop removal mines operating in Central Appalachia, producing more than 20 million tons of coal. Those numbers should be zero. Allowing mountaintop removal mining to continue as residents demand new investments and support for economic alternatives will only burden communities searching for a better path forward. Let the President know we need a strong rule that helps move Appalachia forward. Brian is an environmental news junkie concerned with our lagging energy policy and revealing the true cost of coal on our health, the environment and the climate. He is Appalachian Voices' Director of Strategic Advancement.